Recovering from a personal injury is often accompanied by legal and financial challenges. The skilled team at the Cogburn Law Offices offers legal counsel to people in Henderson, Nevada, and throughout the Las Vegas area. They meet with clients during a free initial consultation to discuss their injuries, their short- and long-term needs, and the best course of action given their circumstances. After suffering an injury due to the negligence of another, insurance alone may not cover all of the resulting damages. The multilingual law office team works together in order to provide their clients with quality legal services. They request and review people’s medical records, accident reports and any other pertinent documentation, as well as interview witnesses, and take and defend depositions. When it comes to legal claims involving car accidents and premises liability, statutes of limitations may force people into taking quick action. That said, insurance companies may be out to protect their bottom line, not to ensure injury victims’ needs are met. 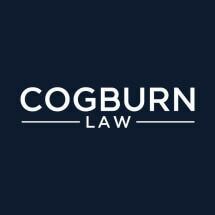 The attorneys at the Cogburn Law Offices strive to help their clients obtain maximum compensation for their medical expenses, lost wages, and pain and suffering. They guide people through the legal process, making sure they meet all of the necessary deadlines and requirements. In addition to aiding their clients with personal injury-related matters, the legal team assists people with consumer law, real estate law, environmental law and commercial litigation issues. The attorneys review the pertinent information, collect any involved documentation and depositions, and prepare legal arguments in order to help their clients resolve the issue favorably.